When I “procrastinate,” or when I have “procrastinated,” it has been because the space of work has been transformed into a space of pain – not because work is challenging but because my workplace is a place of abuse or, in the case of Reeducation, because my work was being used as a way to abuse me. This is why no amount of advice on time management or on the reduction of perfectionism ever worked. This supercilious and condescending advice was in itself a further distortion of the situation since I am in fact and have always been very good on the use of time and on not having to be perfect. In fact, on this last point, I would actually like to take the luxury of perfectionism some time – to take the time to research and then explain fully the questions which really interest me. Filed under Banes, Resources, What Is A Scholar? My complaint about being tenured is that it puts one in a position to be so exploited by the university. The new people, the instructors and the adjuncts must be protected, mentored, developed and maintained; the full professors and administrators have rights; the plain old tenured faculty has to serve them all. I think part of the reason I am or believe myself to be so staunchly pro tenure, and can say I was not hurt by the tenure system itself despite having had, from what I can gather, a significantly rockier path in academia than have many of those who discuss the rockiness of their own paths, is that I never cared about tenure the way many people do. There were people in my graduate program who were already discussing tenure jitters before they had even taken their comprehensive examinations. They were already watching all of their words and actions in case someone at our school, now, might end up voting on their tenure case somewhere else, later. I knew assistant professors who would not wear jeans to campus even on Saturdays, on the theory that it would cause them to be voted down for tenure. I knew other assistant professors who did not feel free to eat lunch with whom they liked. I was told in one of my own assistant professor jobs that to get tenure I must buy a certain kind of house. I was never able to become that paranoid, compromise that far, or believe that by the magical act of never being seen in jeans I could conjure up a positive tenure vote from a person negatively disposed. I have always spoken my mind and never voted in a bloc. These actions have never caused me greater harm than being quiet would have done. So when people say tenure, or the tenure process per se “hurts people,” I also have to wonder to what extent they have through paranoia hurt themselves. I also notice that the senior people who say these things tend to be (although they are not always) at really privileged schools and to have feelings of entitlement I do not really relate to or understand. And the junior people often do not know what the job description of a senior faculty member includes, or that they may have good reason to do and not do the things they do and not do. It is my experience that mistreatment does not end with tenure. I have learned that if a you are an untenured person and you are being bullied by a tenured person, who is being enabled and protected by another tenured person, you can bet that that tenured person is bullying tenured people, too. Also, before tenure universities have to be marginally professional because they know that shenanigans too obvious are actionable. If they deny tenure they also know that they must do it in a diplomatic way. But if they grant tenure, they can grant it in an abusive way, and they feel they can then start the real abuse against which you need the protection of tenure. In this scenario perhaps the Tenured Radical is right, in her way. I still think the answer is more tenure track jobs and more professional behavior. I also still believe in early tenure – much earlier tenure – for as many people as possible. I still even favor tenure at hiring: if everyone were tenured then they would all be able to trade places more easily, nicht wahr? And job candidates now are so much more “professionalized” than they were only a few years ago. Now we interview people who, as T.A.’s, are teaching two upper division courses of their own design and publishing regularly. I am not entirely sure how much more practice time they need, or how much more they should be expected to prove. But the other reason I believe in tenure is that I have swallowed the academic freedom argument, and the idea that the faculty, not the president or the CEO, was the university. I am not sure that I am living in the present, however, not sure I am not imagining we can conserve things which no longer exist, anyway. Read the whole post. Then consider this post on Sean Bell. Then call me self-hating for being white and female and not having voted for Hillary. Then remember that IRL I am often told by white people that I am not interested enough in them, because I am not exclusively interested in them. Then consider why despite “intersectionality” and my extreme opposition to patriarchy my first loyalty might not be to whiteness. Whitemen, as we know, are being discriminated against and “silenced.” They need to be saved by Martin Luther King and perhaps Gloria Steinem, who have explained to the masses what discrimination and silencing are. They also do not understand leadership. They confuse it with authority, which they understand only in its most vulgar form. WM: Let’s go to Chile. Z: Great idea. When and how shall we go? WM: Right now, with the $500 we have. Z: Well, the flight to Chile costs $1500. We’ll need to apply for external funding and that will take until next year. Alternatively, we can go to Mexico for $350. Or is there other money now that I am not aware of? WM: There is no other money. I want to go to Chile, now, for $500. Person A: I want to go to Chile, but I know it costs more than $500. Let’s apply for the external funding and go next year. Person B: I want to go somewhere now, so let’s just go to Mexico. Or maybe Guatemala, hotels there are cheaper. Z: Well, we could go to Mexico or Central America now, and also apply for external funding so as to go to Chile next year. Persons A and B: Yes, yes! We will have fun! Let us start the paperwork now! WM: You are undemocratic, Z! You have again imposed your views on everyone! Because you wanted to go to Mexico you have prevented us from going to Chile immediately! Z: Chile is actually where I most want to go. Since you are also very interested in it and there is also some interest among the rest of the faculty, I would like to make sure we really get there. WM: Your efforts are self-serving, then. You are forcing us to go to Chile, only because you want to! Z: Now, now. I am not forcing us to go to Chile. I am only trying to make it possible, if that is what we really want. I would be happy to go to Mexico, Guatemala, Spain, or anywhere else the faculty decides it wants to go. WM: [Starts to cry.] You are making me cry, Z! You are so mean! Why do you think you are so special? Why is it that you know the prices of flights, and are able to think ahead to external funding for next year? Z: Special? What you are referring to are just normal skills, I know you have them as well. WM: But it isn’t fair! And you could not possibly understand how difficult it is to be in my position! Z: [Aside] Indeed, I do not know what it would be like to be as rechingado as you. It is the weekend, so we are singing. Today we rather incongruously practiced danzón behind the stage while waiting for the Hot 8. Resignation is not one the Hot 8′s strong points. I, however, have discovered that resignation, that machine to reproduce ideology and the social order, is all the rage. People call it “acceptance” (it was formerly known as “realism”). I have only raw data, of course, and I do not know how to crunch the numbers, but my study has two important implications. One: there really is a class of people for whom Reeducation is designed. Such people have a problem they do not want to name and / or are afraid to solve. This group of people is larger than one might think and that is why Reeducators assume one only wishes to “manage” situations (while also clamoring incessantly, inanely, and superficially that “change is good”). What I find fascinating is how they managed to speak to me, a person above thirty and then above forty, as though I were below ten. I would furrow my brow, not understanding their logic. Were they mentally impaired or otherwise incompetent? Could they make it through the day on their own? Should I help them? But this is the paradigm. People complain, but only out of weakness and irresponsibility, so they must be taught resignation. I find the belief in this paradigm quite strange, and the existence of people who actually fit it even stranger. When I was under the influence of Reeducation it seemed that research, teaching, and my real self had been placed in a glass case, where they were now static mementos I could not touch. I would look at them through the impregnable glass and try to break it with my head. I would turn my hand over and over and say, “They are no further away than the other side of my hand.” Why could I not get to them? Now that I have shed Reeducation they have broken through the glass themselves and are teeming in my flesh. My mind is remarkably clear, and it feels like the proverbial steel trap. I can jump hurdles and curl my spine like a cat. That is how I feel some days. Other days I am as tired as I ever was. I used to wonder, how is it that, with a somewhat heavy but not utterly outrageous teaching load I can be so exhausted? The reason of course, as I always knew but which it is very helpful to articulate, is that the atmosphere in which I work is so abusive, and the workplace environment, so hostile. It is hostile not only to me, but to many, so that one must receive, witness, accept, or try to intervene in abuse for large parts of every day. 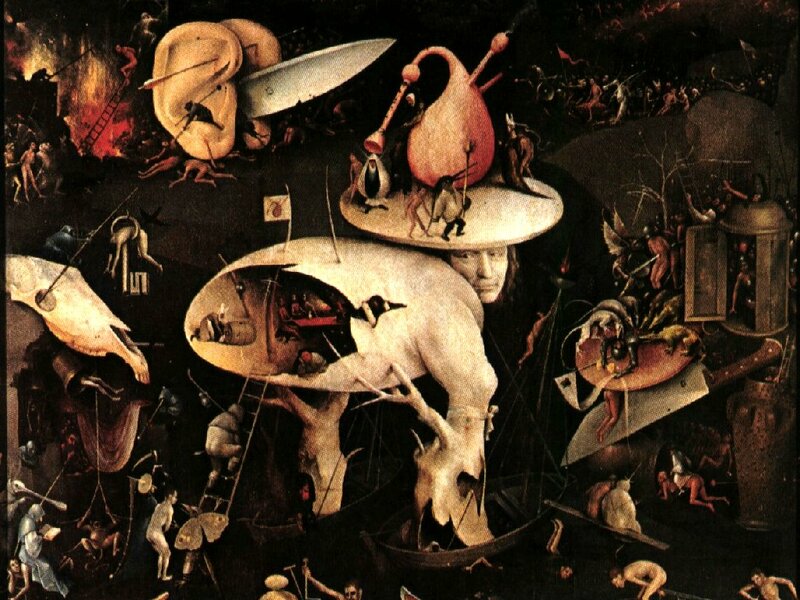 Everyone is acting and reacting either like an abuser or an abuse victim and it is like being inside a Bosch painting. This is how I get so exhausted. It is, however, the weekend, and although Friday is Oxalá’s day, I would like to sing now for Iansã Menina. Ê parrei Oyá Iansã, ê parrei! Please remember Ashley Morris. That is Ashley Morris, of the late, great Ashley Morris blog which did so very much to get us through the storm.